The death of a beloved pet often prompts people to look for another that resembles the one they’ve lost. Thus, when the Simmons Family of Euclid, OH, lost their cat, Dinah, they decided finding another black cat like her was the best way to recover from their pain. They began browsing for black cats on Petfinder and found one listed by PAWS (Public Animal Welfare Society) in Cleveland, who looked perfect. There was only one catch: Midnight was firmly bonded with her sister, Maizey, and adopting two cats wasn’t part of their plan. Read the story in Jenn’s words. Nevertheless, “I took my kids to visit the foster home after being screened by PAWS, and it was love at first sight with Midnight,” Jenn Simmons says. “He was playful, outgoing and friendly.” His sister, on the other hand, was nowhere in sight. So, though the Simmons hadn’t planned on adopting two cats, they couldn’t resist. “Now six years later, we all couldn’t be happier. Midnight continues to be everybody’s best friend and has even learned to jump through a hoop. Maizey made friends with our Beagle, Murphy, and sleeps on my hip every night,” Jenn says. 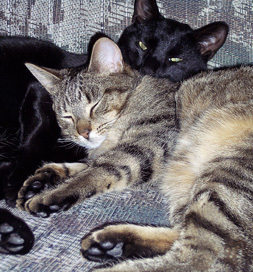 Two bonded cats, two different personalities — but just the right combination to make one happy home.